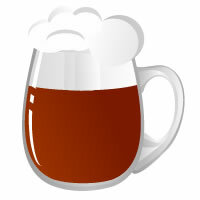 All Grain English Barleywine homebrew recipe. This homebrew recipe uses the following ingredients: Pale Ale - DE, Crystal 40L - CA, Carafa III - DE, Chinook Hops, Cascade Hops, Wyeast American Ale 1056 Homebrew Yeast, Fermentis Safale US-05 Homebrew Yeast. Em 21 Dias Boa de tomar, mas pode se esperar que a maturacao fique pronta na garrafa em ate 24 anos!! !